He doesn't just talk about the environment, he actually did something about it. He's so smart it's almost frightening. His life is one of accomplishment and success, although not without a few setbacks. He loves the media when they lavish him with accolades, which they often do, but he sees a conspiracy when they utter anything else but abject praise. Am I describing Richard Nixon or Elon Musk? Musk has gone on a tirade against the New York Times that vacillates so smoothly between thoughtful and paranoid that it can accurately be described as Nixonesque. Recently, the NYT ran an article that showed a reporter's difficulty in reproducing a trip up the East Coast using only the company's Superchargers that Tesla highly touts. Musk's response is highly logical with charts and curated maps. It raises questions about exactly what Times reporter John Broder thought he was doing, but it also cherry-picks data and draws refutable conclusions. Broder's own response to Musk, as well as the original article and other information out there, makes it sound like the reporter was seduced by the authority of Tesla employee advice over what seems like basic sense. The worst conclusion that can be reasonably drawn is that Broder was ill-prepared for the journey and a bit of pushover. I don't want to referee this grudge match, especially when what's at the root of this spat is how Musk sees the world. Rather than draw the reasonable conclusion, he leaps to the absurd one. Musk first freely admits he's bugging journalists (and his own customers with their acquiescence) because of his incident with Top Gear. The incident, if you're not aware, involved Top Gear saying a ton of positive things about the car and implying, visually, that the car runs out of range after heavy track usage. "While the vast majority of journalists are honest, some believe the facts shouldn’t get in the way of a salacious story. In the case of Top Gear, they had literally written the script before they even received the car." You're either with us, or if you have a critique, you're dishonest. This is a frequent attitude with Musk and one we've experienced before. We've written critical things about Tesla in the past, even personal stories about his divorces. Therefore, when I asked for a comment from the company about the Tesla bricking story last year, I got this answer from Musk about why we weren't getting answers. "If you and Ray decide at some point that you want to bury the hatchet, that would be great. Tesla is going to be around for a long time and we have a lot of exciting products planned. I and others at Tesla would be happy to talk with you if we think there will be a fair (meaning not exclusively negative) article written." Ignoring that we'd had very positive things to say in our two reviews of the Tesla Roadster, it speaks to a narrow world view that's repeated again here when he sees Broder as an anti-EV figure that's part of a broader conspiracy against him based on what appears to be a single, fair article about the state of electric cars. "We assumed that the reporter would be fair and impartial, as has been our experience with The New York Times, an organization that prides itself on journalistic integrity. As a result, we did not think to read his past articles and were unaware of his outright disdain for electric cars." Get it, he's against us! He wrote that not everyone is buying eletric cars! It's the truth but he shouldn't be writing about it! Now, I'm not comparing Elon Musk to Richard Nixon because I think of Richard Nixon as the villainous, moping caricature of him often shown in popular culture. I'm fascinated by Nixon and have talked with some people who worked for him (John Dean, Hugh Sloan) and a few journalists who reported on him (including Bob Woodward and Carl Bernstein). The two men obviously come from dramatically different backgrounds, one being a South African computer nerd and the other being the son of hardscrabble Quaker farmers in California, but both clearly see the world as something that's mutable if the force of will is applied. Both can be very charming. Both have attempted to improve the environment (Richard Nixon's administration proposed and created the Environmental Protection Agency). Both seem intent on fighting a domestic war while pursuing larger, more successful foreign policy aims (SpaceX and China). They also have a tendency to fight battles they're probably not going to win. President Nixon at one point thought it would be a good idea to get Donald Segretti, the young lawyer in charge of disrupting opponent's campaigns by any means necessary, to sue the Washington Post over a story that was actually accurate. "I know he'll lose it, but good God, in the public mind it creates the impression that they lied." Musk might actually believe Broder did lie, whereas Nixon probably knew how bad Segretti was (with Nixon it's sometimes hard to discern where the line was between self-delusion and a calculating desire to blur reality in order to protect himself.) Of course, if you think Musk is sincere, that would make him more paranoid than Nixon. There are many who, as they did with Nixon, will see enemies against the electric car that mostly don't exist (Revenge Of The Electric Car shows even Bob Lutz's willingness to change his tune and embrace the future). They will laud Tesla and see the NYT of all places as anti-EV. Those kind of people will eat it up. But it's nonsensical and harmful to Tesla in the long run. Chelsea Sexton has a good take on this in her Wired piece on Musk v. NYT where she points out how counterproductive this entire storyline was. Even the successful CNN journey shows that a trip that should take roughly eight hours is going to take 13 hours if you want to make it. Not a great selling point. This is a marketing disaster of Tesla’s own making, though it’s hardly alone: Road trips are a dangerous myth for the EV industry to perpetuate at all. Tesla positions the Model S as the first “no compromise EV” able (with the Supercharger network) to take the proverbial “Vegas on a moment’s notice” road trip. Yet after pitching the trip idea to Broder in the first place, Tesla’s own staff needed to issue carefully detailed instructions and make follow-up contact along the way to ensure he got to his destination. In doing so, they busted their own road trip myth before Broder ever left the driveway." Basically, Musk and his team assumed that the NYT was on their side and therefore couldn't foresee the problems coming. They say they didn't research Broder and if they did they'd discover that, after all, he was an enemy. A bad guy. Out to get them. I tend to think they'd have given the car to him anyways, though maybe they'd have prepped him better for the trip. It's possible all this is all a show for his friends in the Valley and we're all being expertly played by Musk. I doubt it. I don't know Musk very well, but after trying to thaw our relationship with Musk a little and going out of our way to contact him before we wrote anything potentially negative I've at least been able to hear a little of the way he thinks. My conclusion, echoed by others who know him, is that Musk sees a solution so clearly in his mind that the details of how you get there and the time in between vision and execution sometimes disappear. The idea of a solution can become almost as good as the solution itself. Therefore, in his mind, perhaps he sees how the Supercharger system works and views Broder's need to constantly call Tesla representatives to get help not as the reaction of someone not fully versed in how the car operates, but rather he sees Broder as someone who had to be making it all up. He wasn't trying to find the charger in the parking lot, like he said, but rather circling in an attempt to drain the battery. This is a dangerous way to think. 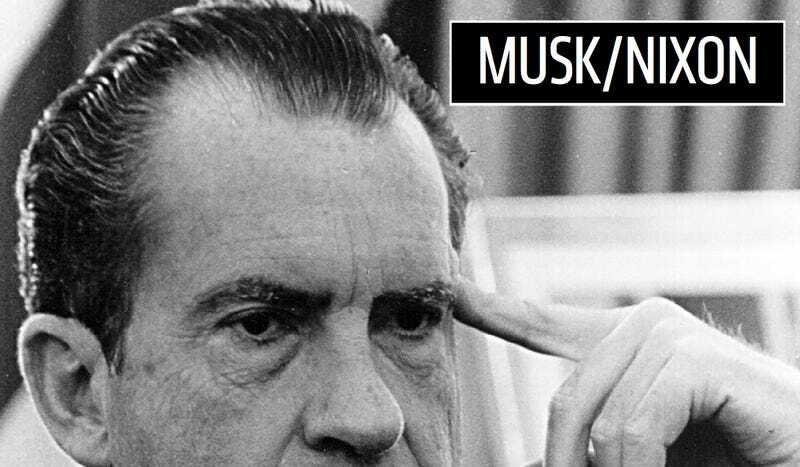 Musk is acting like Nixon, but maybe he isn't Nixon yet. Here's a warning for Musk, then, from Woodward and Bernstein's tale of a paranoia-induced fall from grace "Final Days," in which a doomed president tries to explain his position to a staffer who wanted out. He was a victim of circumstance, of uncontrollable forces. It was the timing, the particular point in history. The Democrats and the press were now working together to get him. He had inherited a much abused office, flagrantly misused by Kennedy and Johnson. But the liberals and the press hated him, and so the rules were being changed and he was going to be made to pay. Tesla, in my opinion, has benefited from more goodwill and trust than almost any other automaker in the last decade. If that stops it's not going to be the media's fault, it's going to be Musk's.